After doing the write up for my second batch of Lambic, I thought it was probably about time to do a tasting of the first. This batch was brewed almost exactly 2 years ago and bottled in late July 2008. This marks the longest I have gone between brewing and drinking the first carbonated bottle of a batch. 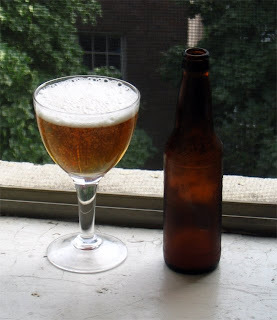 Appearance – Certainly looks the part of a Lambic, clear golden with just a thin wispy white head that sinks quickly. Carbonation still looks a bit low. I am impressed that it is so clear considering it was just the residual microbes doing the carbonating. Smell – Sharp acidity, musty wooden basement, squishy overripe cherries, with some floral alcohols. It smells a bit acetic for a lambic, but not as much as something like La Folie or Rodenbach Grand Cru. The alcohol comes out more as it warms, a testament to its 7.5% ABV (Boon Oude Geuze Mariage Parfait is the only commercial example that strong I know of). Taste – Bottle conditioning has mellowed out the acidity a bit compared to the sample I had out of the bottling bucket, but sourness is still the primary flavor. The acidity is predominantly lactic and plenty sharp with some biting acetic acid in there (which hits me on the back of the throat). It has a minerally lemon rind quality that is interesting. A bit of that grainy aftertaste I seem to get early on with my pale sours, but if the Berliner Weisse and Temptation are any indication it should be gone in a couple months. It is solid, but the complexity of a great Lambic just isn't there. Mouthfeel – Thin with only mild carbonation. The after taste has a very lingering dryness, there are some tannins in there, but I'm not sure if they are from the husks, or the oak. Carbonation still seems a bit low, but it should continue to increase as the microbes work on the more complex sugars that the DME added. Drinkability & Notes – Better than I expected, but I still think it needs another 6 months in the bottle to really come into its own. The acetic acid might be a bit high for the style, but it may mellow out as the Brett continues to work on the beer away from oxygen. I'd say it was definitely worth the wait, hopefully the second batch will be even better. Why transfer your plambic to secondary? I think the bugs will benefit if they are allowed to munch on the autolyzed yeast. What I do will depend how my first batch (which was aged in primary for 2 years) tastes in a few months. I'm not a huge fan of its character at the moment, too acid driven for my tastes (and that is after blending it 4:1 with a cleaner beer). I like the softer acid profile that my racked sours have. I am hoping that this is the first batch in a 3 year Lambic cycle. I may leave the Lambic I do next year on the yeast to give me two very different beers to blend together when the time comes. How did this end up tasting after 6 months (or more) in the bottle? Sadly this batch never came around, still that same weird off-flavor. I recently dumped most of it (although I saved a couple bottle... just in case). Good lesson to always ensure a quickly start to fermentation, even on a sour beer. Luckily each batch of lambic I've brewed has been better than the previous.